2013 Horrors of War II. Slabbed and Certified by Famous Fabrics INK. Pierre Gustave Toutant-Beauregard (/borrd/; May 28, 1818 February 20, 1893) was a Southern military officer, politician, inventor, writer, civil servant, and the first prominent general of the Confederate States Army during the American Civil War. Today he is commonly referred to as P. Beauregard, but he rarely used his first name as an adult. He signed correspondence as G. Trained as a civil engineer at the United States Military Academy, Beauregard served with distinction as an engineer in the MexicanAmerican War. Following a brief appointment as superintendent at West Point in 1861, after the South seceded he resigned from the United States Army and became the first brigadier general in the Confederate States Army. He commanded the defenses of Charleston, South Carolina, at the start of the Civil War at Fort Sumter on April 12, 1861. Three months later he won the First Battle of Bull Run near Manassas, Virginia. 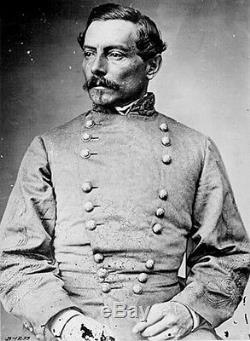 Beauregard commanded armies in the Western Theater, including at the Battle of Shiloh in Tennessee, and the Siege of Corinth in northern Mississippi. His greatest achievement was saving the important industrial city of Petersburg, Virginia in June 1864, and thus the nearby Confederate capital of Richmond, from assaults by overwhelmingly superior Union Army forces. 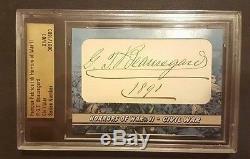 The item "2013 Famous Fabrics Horrors of War II CIVIL WAR SIGNATURE P. BEAUREGARD 1/1" is in sale since Wednesday, March 23, 2016. 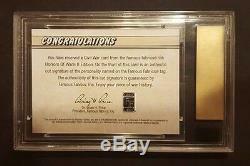 This item is in the category "Collectibles\Autographs\Military". The seller is "toys-and-antiques" and is located in Brooklyn, Michigan. This item can be shipped to United States, United Kingdom, Denmark, Romania, Slovakia, Bulgaria, Czech republic, Finland, Hungary, Latvia, Lithuania, Malta, Estonia, Australia, Greece, Portugal, Cyprus, Slovenia, Japan, China, Sweden, South Korea, Indonesia, South africa, Thailand, Belgium, France, Hong Kong, Ireland, Netherlands, Poland, Spain, Italy, Germany, Austria, Israel, Mexico, New Zealand, Singapore, Switzerland, Norway, Saudi arabia, United arab emirates, Qatar, Kuwait, Bahrain, Croatia, Malaysia, Brazil, Colombia, Panama, Jamaica, Bahamas, Viet nam, Canada, Uruguay.